Solar Light Bulbs: A frugal 55-watt light bulb? | Save. Spend. Splurge. Home › Minimalism › Solar Light Bulbs: A frugal 55-watt light bulb? Solar Light Bulbs: A frugal 55-watt light bulb? The cheap, solar-powered bulbs are actually just clear plastic soda bottles filled with a mixture of purified water and chlorine or bleach which is commonly used in household cleaning products. Each bottle is then inserted halfway into a hole made on the roof of a house, and sealant is applied to prevent leaks and the end result gives the impression of a small, plastic chimney. The bulb gives off light equivalent to a 55-watt electric lamp as the water inside the bottle refracts sunlight and other exterior light. Impractical for Canada (snow? ice? polar bears? 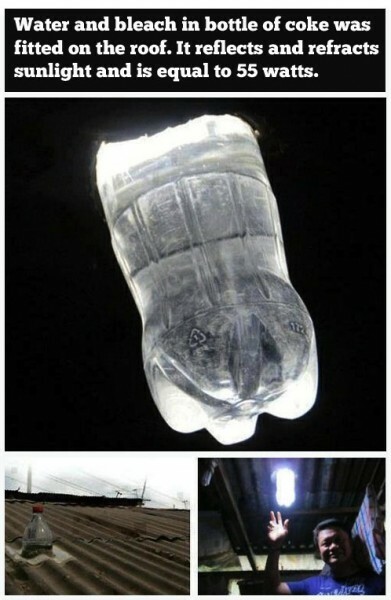 ), but an interesting idea for a cheap lightbulb during the day in such homes. Note to self: should research before commenting! I saw this a couple of years ago and thought it was brilliant. THANK YOU! What a great link and idea. Nice idea, at least temporarily. After a while the UV in the sunlight degrades the plastic, and you end up with water and bleach bombs falling all over your stuff. Still it’s a cheap way for poorer countries.